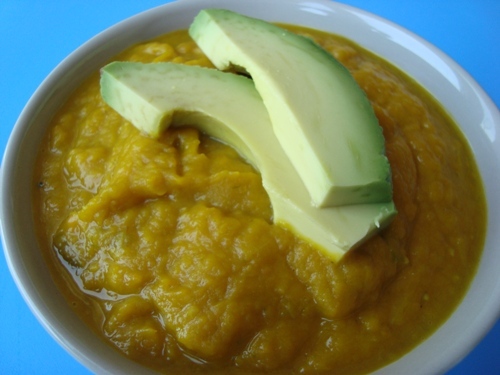 Every mouthful of this savory buttercup squash soup delivers an abundance of cancer-fighting nutrients: carotenoids, vitamin A, real vitamin C, and manganese. 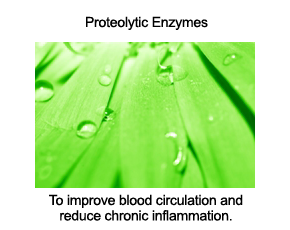 It's also a good source of most B vitamins and omega-3 fatty acids, which makes it an excellent choice for protecting your heart and blood vessels. Before ingesting, please be aware that one or more bowls may cause you to roll around on the ground, as you won't know what else to do as you declare it to be the best squash soup you've ever had. 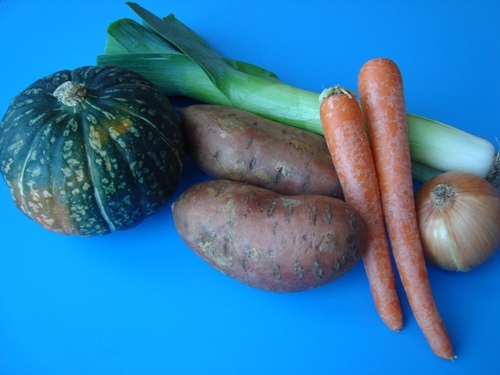 With that said, let's have a look at the main ingredients: one buttercup squash, two sweet potatoes, two leeks, one yellow onion, two carrots, vegetable or chicken broth, extra-virgin olive oil, garlic, sea salt and pepper. Here's a closeup look at buttercup squash - it looks like acorn squash, but it's tastier than acorn by a country mile. Chop buttercup squash into quarters, the sweet potatoes into one-inch rounds, and roast in a baking pan or casserole dish at 400 F for a good 50 to 60 minutes or until squash and sweet potatoes are tender. 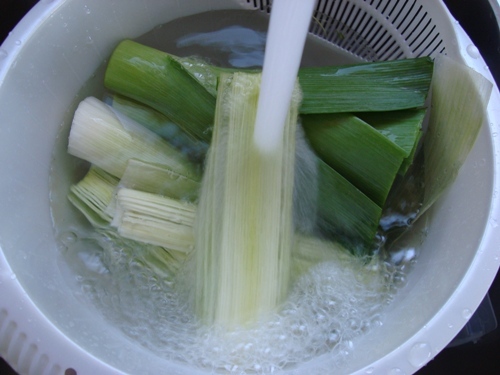 Once your leeks are washed and ready to chop, dice up your leeks, carrots, and yellow onion, and saute in extra-virgin olive oil over medium heat for about 15 minutes, or until everything is soft. 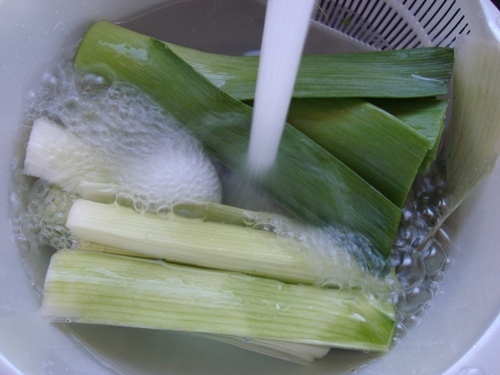 If garlic and/or ginger get thumbs up in your home, add as much as you'd like while the leeks, carrots, and onion are cooking down, but please be mindful that a little of either goes a long way on the palate. This is also a fine time to season with sea salt and pepper to suit your tastes. Once your buttercup squash and sweet potatoes are tender, peel their skins and add them to your leeks, carrots, and onions. It's easiest to wait until the squash and sweet potatoes have cooled down some before peeling their skins off. 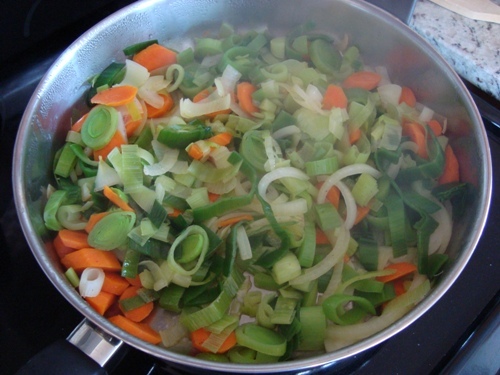 Next, add three cups of vegetable or chicken broth. Transfer all ingredients to a blender or use a hand-held blender right in the pot to give things a whirl until you have your sweet and savory buttercup squash soup. Though great as a stand-alone meal, if you wish to add extra flavor and texture, try topping with fresh cilantro or avocado slices. If you have a favorite squash recipe that you'd like to share with our community, please consider adding to the comments section below. Thank you. 1 butternut squash, 1 apple (any kind), leeks, rosemary, broth. 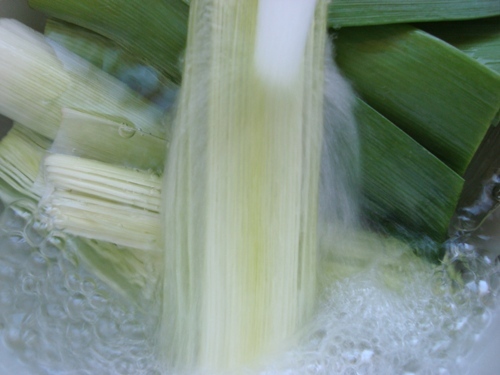 Same concept as your recipe for preparing buttercup soup, season with salt. if you feel adventurous ... add a teaspoon of curry paste when you're sauteing your leeks/onions and finish with a can of light coconut milk.. and you have a great variation of this wonderful soup..
Looks like a good recipe but I have to say I have never seen butternut squash that looks like that. Its usually longer, smooth and orange. The one you have looks like kabocha pumpkin which is also a very good choice. I am sure most any winter squash will do in soup--although butternut and buttercup have similar names yet they are very different squash. Hi Sam, You are right. 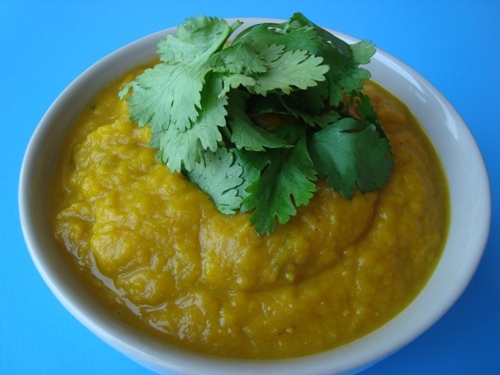 I have been making this soup with pumpkin instead of the buttercup squash and a bit less leeks for quite a bit of time... 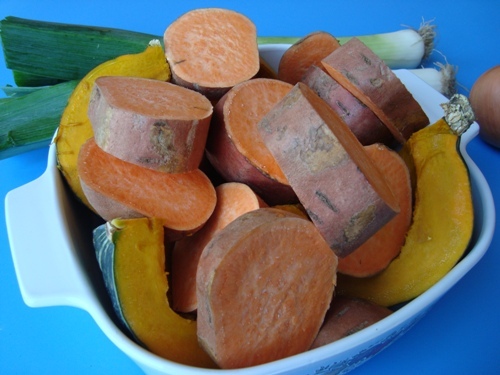 I love the taste the sweet potatoes with pumpkin or different varieties of squash! Many thanks for the gorgeous recipes! They are so clear and it makes them even easier to make when we can see exactly what to do. Thank you. 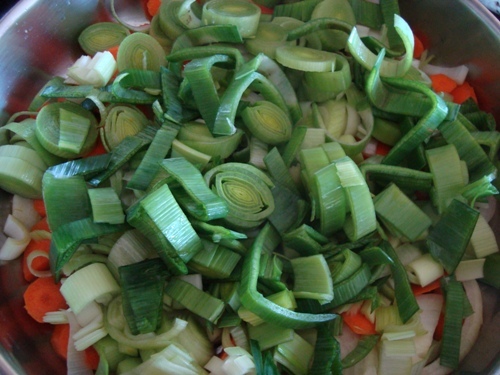 I love squash soup and tried yours with leeks and carrots ! Yum! I still added an apple and a little white wine and sage which mine calls for! I can buy butternut squash frozen already peeled and chopped(C&W Brand or Trader Joes) which makes this soup very easy! !Try it hot with a nonfat yogurt dollop and chopped nuts or cold with pepper and a bit of parsley! Thank you again Dr. Kim! Saw this recipe yesterday, KNEW that even though it is MAY I had to try asap. Did and it was as good as I had hoped it would be. Abundant in vegetables!! No diary! A little time consuming but I could most likely work on that. Really delicious. Thanks for the recipe Dr. Kim. I was looking for a squash called buttercup at my grocery store. I ended up having to choose between the familiar butternut and not so familiar acorn squash. I was wondering if there was a misprint in the name of the vegetable. Anyways, I picked up the acorn squash to try something different for a change and the dish was still superb. Can't wait to make the recipe again as soon as I find me some buttercup. The squash pictured in Dr. 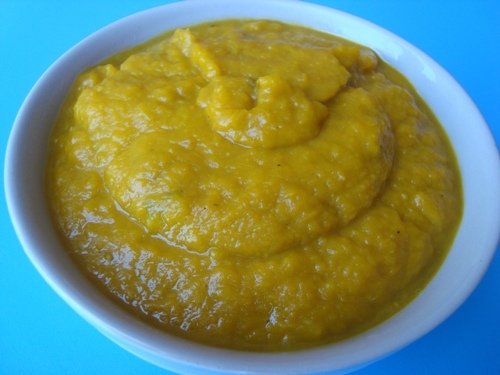 The squash pictured in Dr. Kim's photos of his soup are "buttercup", not butternut,acorn, etc. 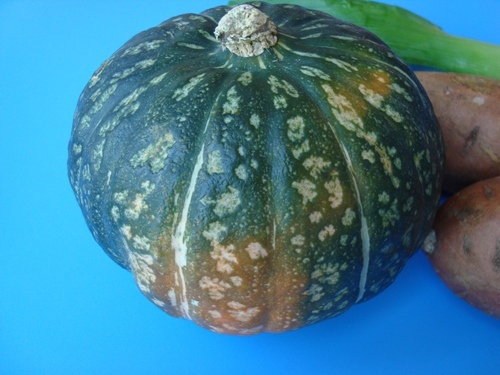 This is a 2-6 pound winter squash that has a bit of a boxy shape, dark green skin and dark orange flesh. It is excellent, rich, and yummy. If you can't find buttercup see if you can find kobacha - the spelling in your locale may be a little different. Nonetheless, the flesh of both squashes is rich, extremely tasty and satisfying. All of the soups and their variations are just great with this vegetable - not to mention how great is the rich carotenes and antioxidants, VitA, etc. in squashes. - But, let me give you another option: the skin of the butternut squash is tender and delicate and, let me tell you, yummy. Think baked potatoe skins but do it with butternut or kobacha squash skins. After you've scooped out the flesh for the soup, keep the skins and add your favorite potatoe skin fixins. You can broil them, add spices, add salsa, drizzle with veggie nutritional-yeast "cheese" sauce, artichoke hearts, asparagus!!! Need I go on? You get the idea. 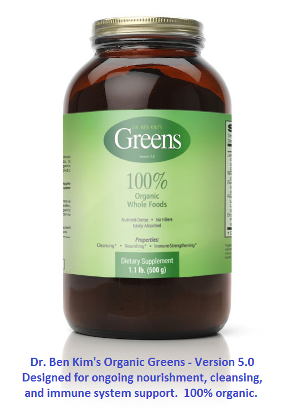 Be creative and eat those phytonutrient vitamin rich skins ..........and have fun! I hunted for buttercup squash, but could not find it. I finally settled for a Kabosha squash from Sprouts Market. When I looked on the internet for both squashes it turns out they are the same. I add some ingredients to it ! I put one sweet potatoe instead of two and add normal potatoes! Seriously, this is the best soup EVER ! That looks like a kabocha squash, not a buttercup.